If you are staying in Tokyo on 9 & 10 July, so lucky! It’s the days of yearly Hozuki Market (Hozuki-Ichi) in Asakusa. 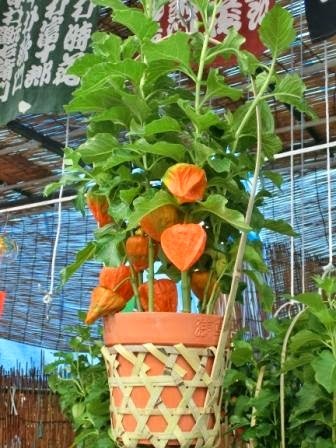 A lot of Hozuki (= Chinese lanterns = plant, not lamp) are sold in Sensoji-Temple. This market is originated from hundreds years ago. It is believed by people that praying in Asakusa on 10 July is worth praying 46000 days (Shiman-rokusen-nichi in Japanese.) It was kind of a folk religion and visiting Sensoji Temple on 10 July became very popular. So excited people gathered too early on 9 July. Then, what does the relationship between the belief and Hozuki? Actually, Hozuki Market was once held in Atago Shrine on 10 July, as part of Shiman-rokusen-nichi. At that time, people liked Hozuki as a medical herb. Then, people started to feel, “Talking about Shiman-rokusen-nichi, Sensoji-Temple in Asakusa is the place!” As a result, Hozuki sellers started Hozuki Market in Sensoji-Temple as well, and this custom has been lasting since then. The history and origins are from common people, not a government authority or something like that, so there is not a fixed story. People’s wishes for happiness mixed several folk beliefs. These are Hozuki pots. 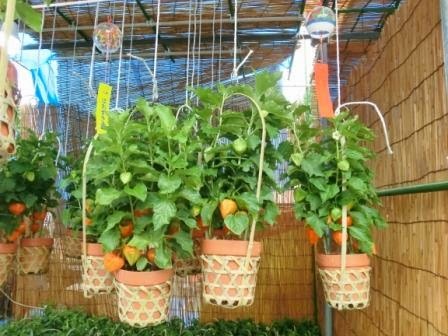 Unique fruits, isn’t it? (Not for eating, normally.) Around 2500 yen. Around $25. And the two things of glass and a long piece of paper are wind-bells (Furin in Japanese,) which is one of the symbols of Japanese summer. Some sellers sell a pot with a Frin with several coins. Cool! There are many sellers in the temple. Unfortunately, it was rainy, but there are many visitors with a pot in their hand. 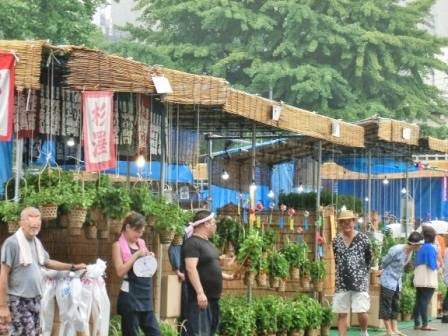 In case you want a pot, I have written about shipping a plant pot internationally in Iriya Asagao (Morning Glory) Market, so please check it out. And I believe many of you want to get some great souvenirs easy to get and take home. The point is that Hozuki goods are sold on only the 2 days of Hozuki Market! My best recommendation is to get a replica Hozuki stick. In souvenirs shops in Nakamise Street, there are 200 yen Hozuki replicas. Some of Hozuki sellers have the sticks with a Hozuki Market tag from 1000 yen. And I saw a Hozuki decoration & wind-bell set for 1500. Definitely recommend! Want something small? There are also Hozuki towels, tapestries, and other items are sold in Nakamise and the streets around. 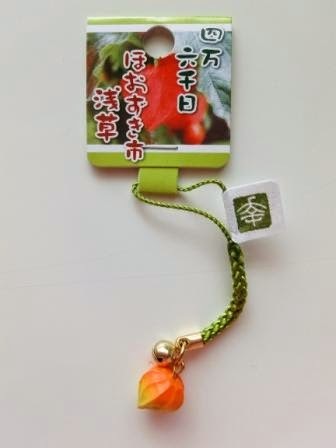 And this is a Hozuki strap (Netsuke, an old Japanese style strap) for 380 yen. 3 for 1000 yen. The paper tag reads, “Shiman-rokusen-nichi,” “Hozuki Market,” “Asakusa.” Great! It’s fantastic to get some of them because they are VERY RARE. Even if your friends talk about their travel in Tokyo, they hardly have these Hozuki souvenirs in Asakusa. You are lucky enough to stay in Tokyo in the 2 days a year. Your trip will never be same as most visitors of Tokyo! Have a good day in Tokyo! How to Get There & Maps: Sensoji-Temple is Asakusa‘s landmark, so you will not miss it. The nearest station is Asakusa of Ginza Subway Line. For details, link to Tokyo Direct Guide.